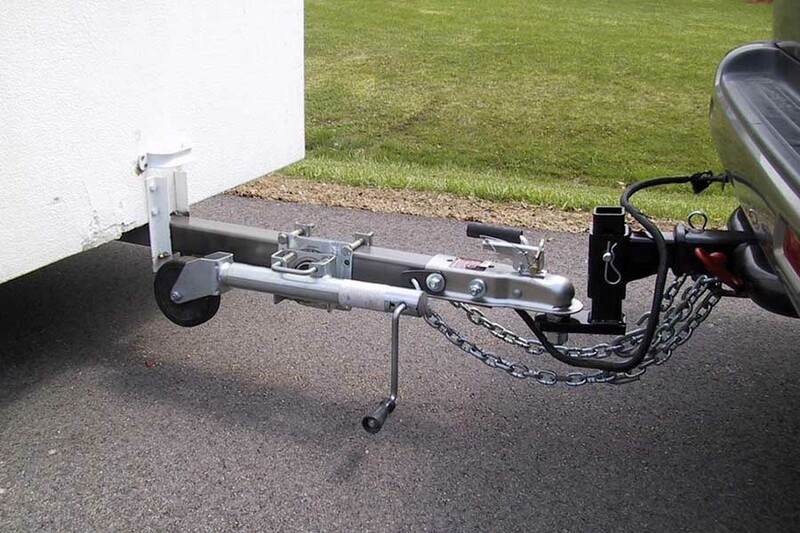 There are several different types of trailer hitches. They range from the common ball type hitch to gooseneck, 5th wheel to inverted balls. All of which feature different principles of connection and weight ratings. The type and size trailer that you purchase or build will dictate to some degree the type of hitch you will require on your vehicle. Let’s Look at a Few of the More Common Hitch Connection Types Before you Purchase for Your Vehicle’s Hitch! Undoubtedly the most common type trailer hitch used today. These hitches feature a machined ball which bolts on to a hitch receiver for quick removal as well as height adjustability. They come in the following sizes 1 7/8”, 2”, and 2 5/16” with capacities from 2,000-25,000 lbs. The size of ball that you require will depend on the size of your trailer coupler. The coupler is typically welded to the hitch of the trailer and must match the ball size on your vehicle. These are commonly used with bumper pull trailers which are the name that ball type hitches are often interchanged with. Gooseneck hitches got their name from the fact that the front of the trailer kind of looks like a gooses neck. They often get confused with 5th wheel type trailers, and in reality, they are much different. Basically a 2 5/16” trailer ball is used in the bed of a pick-up truck, and the front of the trailer gooses over the bed rails and connects to the trailer ball by a coupler. This style of connection is usually rated at 25 – 30,000 lbs and used on heavier trailers such as car hauler trailers, horse and livestock trailers as well as dump bed trailers. Instead of the trailer ball being placed at the rear of the vehicle, it is usually placed over the tow vehicles drive axle. This greatly reduces trailer sway which makes for a more pleasurable drive over long distances. Long box pick-up trucks are typically required for gooseneck trailers, because the ideal ball placement is about 6” ahead of the drive axle. In a short box truck this can throw the trailer to close to the cab of the truck which makes sharp turning impossible and could damage the cab of the truck. There are hitch extensions available capable of solving this problem. This style hitch is probably most recognized on over the road trucks. It consists of a King Pin which is about a 3” in diameter hardened steel shaft with a recessed notch that circles the center of it. The king pin is welded into the trailer nose and connects to the truck by resting and locking into the 5th wheel plate bolted to the truck. During connection, the 5th wheel plate contains a set of jaws that mechanically lock around the king pin. This style connection is the strongest in the industry and carries trailers well over 80,000 lbs. You will find smaller versions of this style used in the 5th wheel RV trailer market with capacities of 25,000 lbs. Reese trailer hitch is a market leader in the 5th wheel hitch category as well as offering bumper pull type hitches for most of all vehicle types. It never fails to amaze me that people who have spent thousands of $$$ on their trailers (not to mention the toys they’re hauling), don’t adequately protect them against theft with a simple trailer hitch lock <-- read more about them.